Focus Areas are the company wide focus for a specific period. It's what connects employee's OKRs to the company long term strategy and vision. A Focus Area can be broken down into narrower Focus Areas. Only admin users can add Focus Areas. However, all user can align their OKRs with them. Click Focus in the main menu. Click the blue Add Focus Area button. Type your Focus Area in the text field and click Add Focus Area. Click More in the main menu, then click Manage Focus Areas. Click the + button in the top right corner. Type your Focus Area in the text field and click Add in the top right corner. 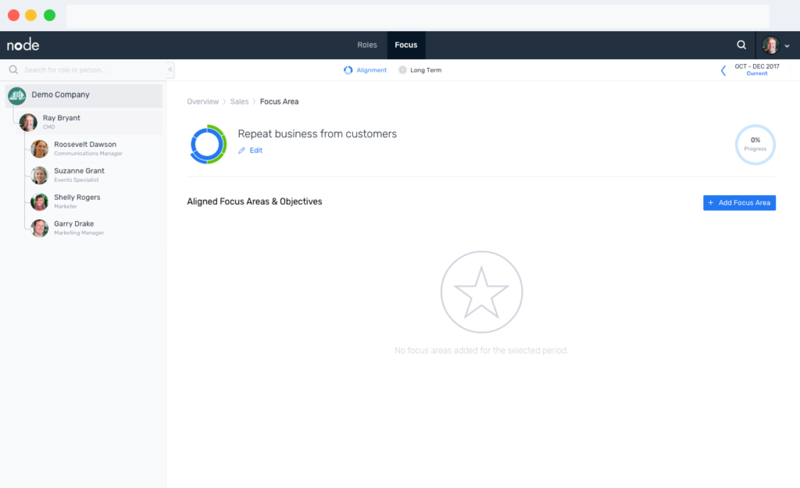 Your new Focus Area is now added and can be used to align OKRs or narrower Focus Areas with. Find the Focus Area that you want to break down to a narrower Focus Area. On the Focus Area page, click the blue Add Focus Area button (+ button on mobile). Type your Focus Area in the text field and click Add Focus Area (Add on mobile). Your new Focus Area is now added and you can see the parent Focus Areas in the breadcrumb at the top of the page. Now you know how to add Focus Areas. It's also good to know that you can add Focus Areas to a coming period. This is good to do some time in advance so that, when the period is closing in, employees have Focus Areas to align their new OKRs with.